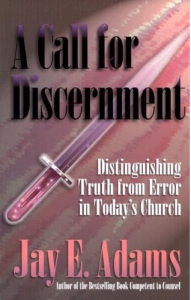 Adams (the author of Competent to Counsel and many other books) wrote this book in 1987 which was reprinted in 1998. He defines discernment by first explaining that the world sees things in a “continuum thinking” with black and white being the extremes and most things between being various shades of gray. God sees things by “antithesis,” as truth separated from error. “In the Bible, where antithesis is so important, discernment—the ability to distinguish God’s thoughts and God’s ways from all others—is essential. Indeed, God says that ‘the wise in heart will be called discerning’ (Prov. 16:21).” Adams takes the reader through a progression of steps discovering Biblical discernment and common lack of discernment, and then proposes a plan, much like a journal, for a believer to build discernment in various areas of the Christian life. Adams is a very straightforward writer and pulls no punches about the world, sin, and the Christian in the world. He admits his plan is one of many approaches that may be taken, but he strongly advocates making some plan for Biblical discernment.